Natural Killer cells (white). A cancer cell’s worst nightmare. The immune system is the final arbiter in your body’s fight against cancer. Our immune system is designed to protect us from our own cells that have mutated and turned against us. Cancer cells are commonplace in our tissues, but a healthy immune system hunts them down like a bloodhound on the scent and stops them in their tracks. A favorite metaphor in describing the immune system is the military. This image is perfect with respect to that part of the immune system that is intended to attack cancer. The battle is waged with a ruthlessness found only in total war. No one is pardoned, no prisoners are taken, there are no hostages held. Once activated, your immune forces will not stand down until they are satisfied that not a single cancer cell remains. Total destruction and elimination of the enemy is required. The fact remains that there is always a chance that there are some cancer cells left that survived even though they cannot be seen or found with any test used today. These cells can begin to grow over time and cause the cancer to recur. Even though treatment may seem to have eradicated all of the cancer, there may be just one tiny cancer cell left someplace in the body. That is why it is so crucial to take every step possible to restore your immune system’s health. Once activated your immune cells will not quit until they have tracked down and eliminated every rogue cell in your body. 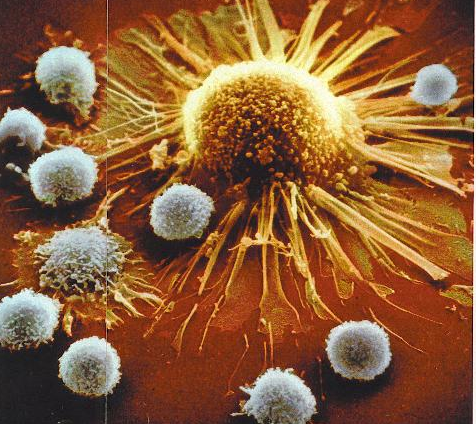 The role of the immune system in controlling cancer was hotly debated for decades. However, as recent as May 2006, the concept of the immune system as the body’s primary natural defense system against cancer received strong evidential support that reverberated around the medical science world. This support came as a result of a study at Wake Forest University School of Medicine. The results of this study indicated a signaling relationship between cancer cells and the immune cells – immune cells do hunt down cancer cells throughout the body! Survival from cancer ultimately depends upon a healthy and vigilant immune system. Your immune system is the final arbiter in your body’s fight against cancer. In interviews with cancer patients, a few themes of concern are expressed repeatedly. One of these concerns is how to build up the strength of your immune system without interfering with your treatment? That is a major topic of discussion of this blog. Attack Cancer – Restore Immune Health is unique. Unlike other blog sites concerning cancer, it is not about difficult treatment decisions, underlying causes of cancer, or subjects such as alternative treatments. It is only about how a healthy immune system attacks and halts cancer and how to restore your immune system’s health.